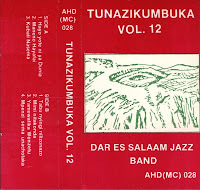 Good stuff...I just checked and I have a number of singles by the Dar Es Salaam Jazz Band along with a compilation entitled Hits of the 60s Vl 3 that has a few tracks from Njohole Jazz Band. As for background ont eh band no more I'm afraid. "POPULAR MUSIC, SPORTS, AND POLITICS: A DEVELOPMENT OF URBAN CULTURAL MOVEMENTS IN DAR ES SALAAM, 1930s-1960s"
Thanks a lot for that info, zim! I have more of this Ahadi series and will post more later (this time with a link to the muzikfan-site). Quote: "Founded in 1932, the Dar es Salaam Jazz Band ranks as the country's oldest dance club and band. Based in the city's Kariakoo quarter, the club fostered a legion of Dar's best musicians and became a leading voice on the town's entertainment circuit until its fall in the 19705. Throughout the 1960's the band was lead by the legendary Michael Enoch, solo guitarist, multi-instrumentalist and teacher of many Tanzanian dance band musicians. Enoch later switched to saxophone and came to invent the inimitable horn sound of Mlimani Park Orchestra, until today one of Tanzania's leading bands"
Thanks for all these gifts. Link no longer seems to work. Thanks for rare music, especially the Laba Sosseh lp. I have uploaded the file again and it should work now. (But if it doesn't let me know). Thanks for fixing the link and wonderful music. Thanks a lot for this post. I have a problem with the download link, it's very slow and track#7 is corrupted!! @Abdullah: I have uploaded the file to another server. Hopefully this solves the problem. If it doesn't, let me know. The link if fine now, many thanks. Thanx very much from Italy for this and your whole treasure blog !